Welcome to the world of Farm Fresh Forensics! Farm Fresh Stories and Crime Scenes, What a mix! CSI meets Green Acres in The Shack! Farm Fresh Forensics is available at Barnes & Noble and Amazon. Life doesn't get more real than field mice in the morning and lab rats at night. Come and sit a spell with us. Enjoy the Circle of Life! You'll never look at a fly the same way again. When a Crime Scene Investigator also takes up ranching, life lies somewhere between the barnyard and the Body Farm, where the murder of a chicken can get a full scale death investigation and you bounce between field mice in the morning and lab rats at night. Farm Fresh Forensics is the true story of a Crime Scene Investigator juggling farm life at home with the bloody work of murder in a major metropolitan city at night. 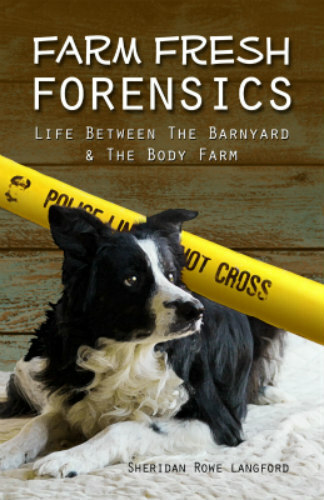 With one foot in the trench of tragedy and the other in a corral of comedy Farm Fresh Forensics invites the reader to slip under the crime scene tape and experience the real stories behind the 5 o’clock news. Few places better illustrate the circle of life than a barnyard where a Border Collie is the professor and a goat can earn his degree in the field of Forensics. This is a story of growth. It is the growth of a Crime Scene Investigator, the growth of a rancher, and the dawning of faith. It is true that life is a tapestry and we’re only looking at the back side. If you raise animals, spring is like having a second Christmas, except you cannot shake the boxes. The walk of shame. I'm all too familiar with it. If you run a farm you probably walk that walk too. I prayed my aim was true and squeezed the trigger. Once you have had one, you never want to be without one. At some time or another most adults have stared in confusion at a child's homework.